*Imitating airplane crashing sounds* Pshhhhhhhffffoooom… Chhhhrrrr.. BOOOOOM! You crashed into some lands. Your spacecraft? Devastated. Lifeforms? Unknown. Surrounded by weird resources and biomes, you will try to make the best out of it. This is the premise of Crashlands, a game crafted by Butterscotch Shenanigans. So put on that purple onesie and get ready to farm and build some alien stuff! Two beings, a purple guy named Flux and a robot named Juicebox, are chilling on their spaceship. Out of nowhere, a giant alien head appears as he asks for a specific part of the ship. He continues to forcefully take this requested part, forcing Flux and Juicebox to crash-land onto the nearest planet. As they try to find a way to leave the planet again, they quickly find themselves communicating with the locals and performing multiple tedious tasks and violent quests. There are no cinematics in the game, but there are plenty of conversations as you progress in the story. Most of the conversations are written with humor and are entertaining enough to read. 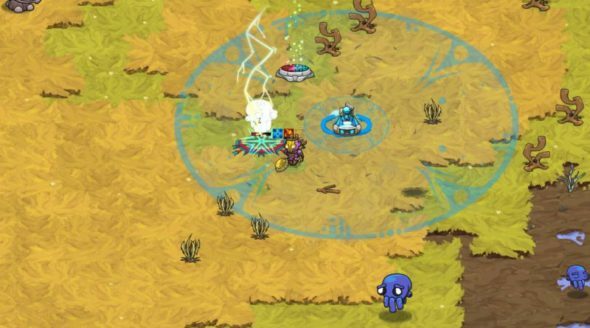 The graphics in Crashlands aren’t that amazing. Mainly because the represented style is seen from a top-down perspective with clearly repeating elements. The animated characters still look pretty slick and detailed despite their small appearance. The colors are quite bright but because of the repeating nature of every bit of biome and enemy, this barely holds any ground. Especially stuff such as houses to build, which in a survival game you expect quite a bit from, are rather disappointing and like a lot in this game, could have gotten a bit more effort. The sound really isn’t that special, but enough for the game as it is. There’s a mellow Sci-Fi type of background soundtrack, and there are short, small bleeps and bloops being used for everything in the game that simply fit their designation. There’s nothing special about any of it, but it works. Also, across the entire game you will never get a single piece of voice acting, so there’s simply not that much to tell about the sound. 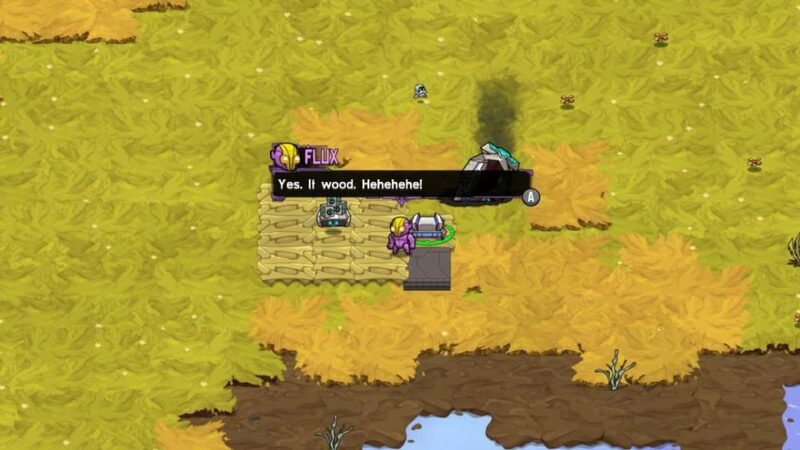 Crashlands is a survival game with an adventurous story. It combines elements of other survival games such as Don’t Starve. You can scavenge some products that are scattered on the ground such as sticks, but eventually, the story lets you create more and more advanced stations to work with different materials such as stone slabs and creature skins. The easy-to-play style that the game has, quickly makes it accessible for all ages and somewhat intoxicating as well. You click a monster, you attack the monster, you click something you can farm, you farm it. You click something you can’t interact with yet, the game will let you know. The negative side to this is that the game is a huge grind. And, compared to other games, it’s just not that exciting anymore after a little bit. For one, the Crashlands map is pretty big and it takes some time to get to places. Now, in other survival games, often you pick up sticks and stones to craft basic elements such as a basic crafting table. 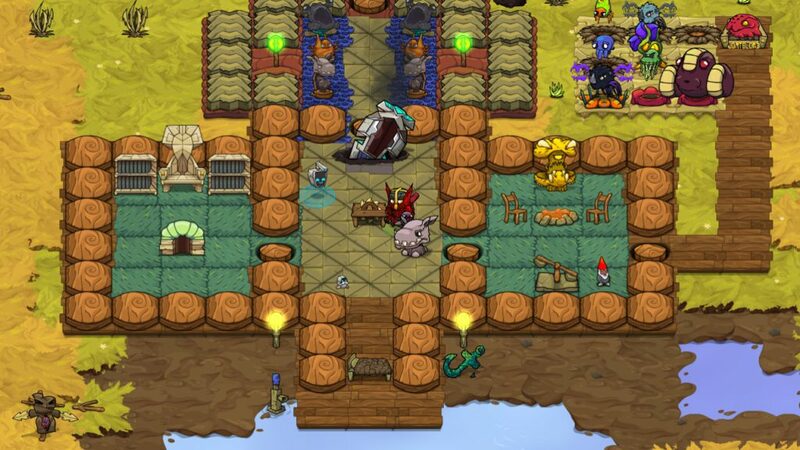 In Crashlands, you have to create a basic crafting table from some other basic crafting table to start. This causes a heap of frustration when you just decided you would like to create something, yet you need to travel back a long time simply to create some type of flooring and a crafting table there. The game does seem to have portals to reduce this time spent walking, yet upon closer inspection, they are mere ”home bases”, pads you can touch to quickly teleport back to or respawn. These types of elements are examples of ”stretching” designs, a.k.a stuff that will make you spend more time in the game than you would actually need to. This makes the game less fun. A different problem that the game has is that it pretends to let you do a lot of things and create cool stuff, but in reality, it’s very limited in what you can do. The game has a few usable items that will always be multiple pieces of armor, and an option to craft one out of three different weapons depending on what you like. The fighting style doesn’t really differ much depending on the weapons, so it all seems rather bland. You can craft some potions and other usables as well, but basically, the game is so easy and accessible that none of it makes much difference. Last, you can create usable flooring and walls to create a safe zone, but no matter the quality of these, they will always look primitive and pretty much the same. All other items are decorative, such as a leather chair. You can’t actually use those though, it will just take up tiles in your house. 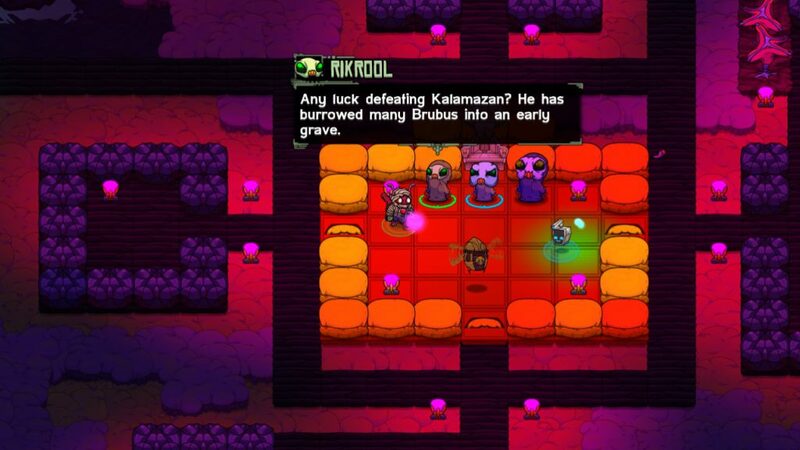 Let’s just say that there’s a lot Crashlands could have taken from other survival games that they didn’t, and it didn’t work out in their favor that well. Crashlands is fun in its own way. Because of the way it’s presented it’s a nice thing to have for any age and almost a stepping stone to other survival games. This also means, sadly, that there’s a lot that could have been done better. The amount of actual usable items is greatly disappointing, and the design of the style leaves more to be wanted as well. The game is clearly designed as something practical, and that might have been very nice while playing on a mobile device. But for a platform like the Nintendo Switch, a better design could have been thought of.